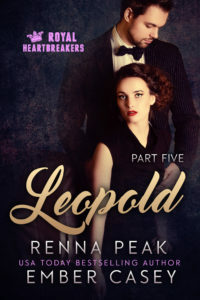 Leopold: Part Five will be available for purchase September 27, 2016. The king’s demands are beyond unrealistic. Do we really have to choose between Leo giving up his life and me giving up mine? Finally, Elle is in Montovia with me. But she didn’t exactly get the welcome I expected. Now I have two choices: give up my title in order to be with Elle, or prove to my father that I can be responsible. Unfortunately, responsibility for me is easier said than done. Especially when I seem to lose all sense of control around Elle. There has to be a way to find our happily ever after. Together. This is Part Five of a six-part contemporary romance serial by bestselling authors Renna Peak and Ember Casey.